Courtesy Prof. Patricia Reiff, the Rice Space Institute. Paid for by NASA MMS education program. Also thank various websites (listed) for imagery. This may be freely copied for classroom use; contact Prof. Reiff for commercial use. Why don't we have a lunar eclipse every month? Does the time of the eclipse depend on where on Earth I am? A lunar eclipse is when the Moon moves into the Earth' shadow. What would you see if you were standing on the Moon? Will it look like a solar eclipse as seen from Earth? If it is in the "partial" phase at Earth will it be in the partial phase at the Moon? Will all parts of the Moon be the same color? Are all lunar eclipses the same color? If you were on the Moon, could you see the solar corona during a lunar eclipse? Are lunar eclipses safe to view with the naked eye? 1. Why does a lunar eclipse only happen during full moon? Only during full moon and new moon is the Moon in a line with the Earth and Sun. If the Earth is in the middle, the Moon is ʻfullʼ and fully lit by the sun. Only then, if the alignment is perfect, we get lunar eclipses [the Earth's shadow falling on the Moon]; if the Moon is in the middle, the Moon is ʻnewʼ (we see only the dark side) and, if the alignment is perfect, we get solar eclipses [the Moon's shadow falling on the Earth]. 2. Why don't we have a lunar eclipse every month? The plane of the Moon's orbit around the Earth is not exactly the same as the plane of the Earth's orbit around the Sun, so the Earth (as seen from the Moon) generally passes over or under the Sun during times of Full Moon. Only twice a year, when the orbits cross, at the "nodes", are eclipses possible, called "eclipse seasons"; even then, the Moon also has to be in the right place in its orbit to experience an eclipse. There will generally be at least two partial lunar eclipses each year, but there can be more. If there is a total solar eclipse that season, then there must be at least a partial lunar eclipse two weeks earlier or two weeks later. 3. When is the next lunar eclipse? The best site to find out the next lunar or solar eclipse is at Goddard Space Flight Center http://eclipse.gsfc.nasa.gov/lunar.html. In 2014-15, there are four total lunar eclipses in a row: http://eclipse.gsfc.nasa.gov/LEdecade/LEdecade2011.html: Apr 15 and October 8 of 2014 and April 4 and September 28 of 2015. 4. Does the time of the eclipse depend on where on Earth I am? Times for lunar eclipses are given in UT (Universal Time), which is the official time (based on Greenwich Meridian Time, GMT). Since it is the Moon that is moving through the Earth’s shadow, it occurs at the same Universal Time for all. But your local time of the event depends on your longitude (your time zone), and whether you are in Daylight Savings Time or not. The general principle for lunar eclipses is: if you can see the Moon, you can see the eclipse. So, more than half of the Earth can see a given lunar eclipse, since the eclipse will generally last one to two hours (approximately an hour of totality, plus partial phases). Some, however, will miss the beginning of the eclipse because it starts before their sunset, or miss the end of the eclipse because it ends after their sunrise. 5. A lunar eclipse is when the Moon moves into the Earth' shadow. What would you see if you were standing on the Moon? A partial or total *solar* eclipse - the Earth will cross in front of the Sun. 6. Will it look like a solar eclipse as seen from Earth? Not exactly, because the Earth's atmosphere can scatter and refract (bend) sunlight. The "penumbra" is the area of the earth's shadow that is only partially dark (the Earth covers only part of the Sun), whereas the "umbra" is the area of the shadow where the Earth covers all of the Sun, and so is the darkest. When the Moon is in the umbra (totally eclipsed), the Earth would appear to have a red ring around it from sunlight refracting through the atmosphere. Only at the beginning and ending of totality might you be able to see the Sun’s corona from the Moon, and only on the side where the Earth just barely covers the Sun. Note that most images you see on the web are not very accurate… here is my prediction when we finally get to see one. At left is the partial phase (the Earth’s angular size is much larger than the Moon), and on the right is just a bit of the corona visible just after totality begins (a little of the corona should be visible on the right just before totality ends. 7. If it is in the "partial" phase at Earth will it be in the partial phase at the Moon? It depends on where you are on the Moon. If your location is in the umbra, you will see a total solar eclipse. 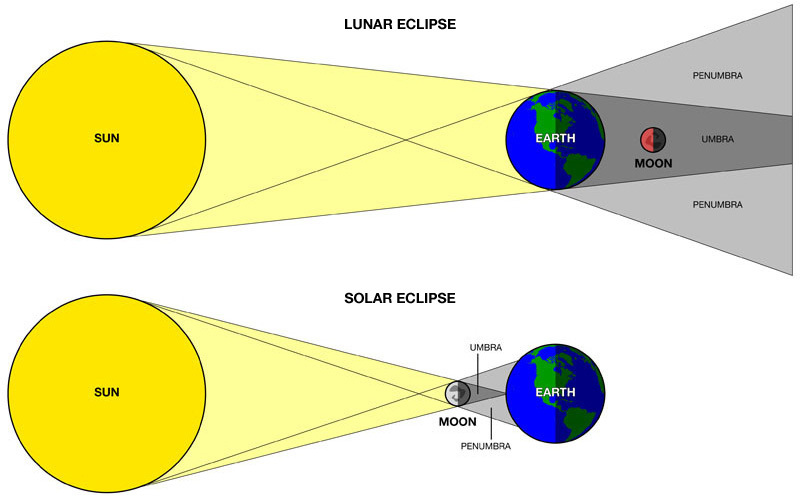 If you are in the brighter part, the penumbra, you will see a partial solar eclipse. When we see a "total" lunar eclipse, then the entire Moon is inside the umbra and everywhere on the Moon would see a total solar eclipse. 8. Why does the Moon turn red during a lunar eclipse? The light from the Sun is refracted (bent) by the earth's atmosphere, but the part of the solar spectrum in the blue is scattered. That's why the Sun looks red to us at sunset (seeing direct sunlight) and the sky looks blue (seeing scattered sunlight)! 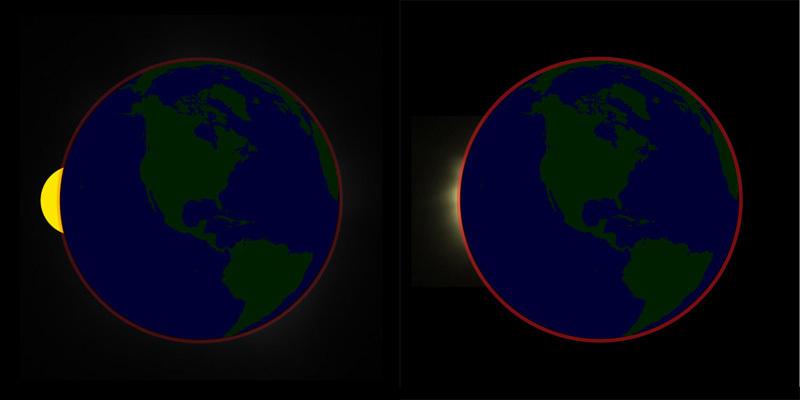 If you are on the Moon during a total lunar eclipse, you will see a dark Earth with a red halo of the atmosphere around it - see http://apod.nasa.gov/apod/ap070302.html for an artist’s conception. 9. Will all parts of the Moon be the same color? The edge of the Moon that is closest to the penumbra will need less bending of the light to be lit by scattered light, so will appear brighter. It will also be partially be lit by the Sun’s corona. For the eclipse of September 27, 2015 I predict that the SOUTH side of the moon will be brighter. This diagram is from eclipse.gsfc.nasa.gov - the best place to learn about upcoming eclipses. Note the times here are in UT: subtract 4 hours for EDT, 5 hours for CDT, 6 hours for MDT, 7 hours for PDT, etc. 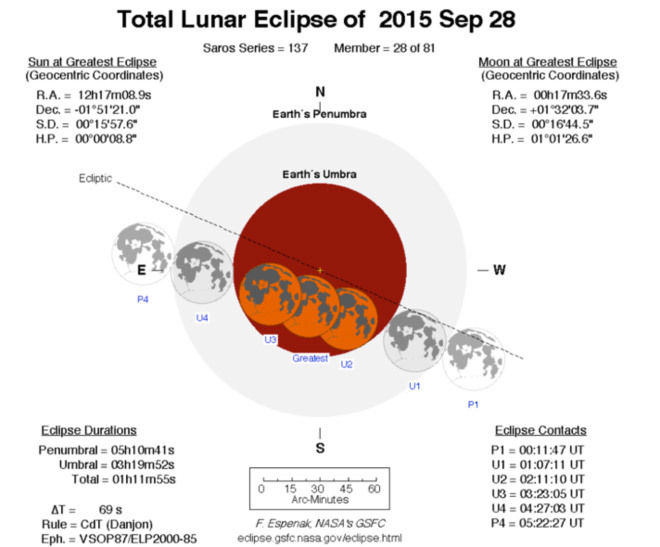 For the full version of this figure see http://eclipse.gsfc.nasa.gov/LEplot/LEplot2001/LE2015Sep28T.pdf. 10. Are all lunar eclipses the same color? Sometimes because of volcanoes or dust storms on Earth, the Earth's atmosphere is dustier and so less light can get through. In that case the Moon will appear a darker red because less light will be able to reach it. 11. If you were on the Moon, could you see the solar corona during a lunar eclipse? Here is a NASA simulation, but I don’t think the corona would be visible until the sun is completely covered. 12. Are lunar eclipses safe to view with the naked eye? Absolutely, lunar eclipses are always safe - use eyes, binoculars, telescopes, any kind of camera or videocamera - enjoy it! Be sure you use a "fast" setting so that time exposures don't cause the image to blur. Solar eclipses, on the other hand, are DANGEROUS except for the lucky ones in the path of totality, and only while the eclipse is TOTAL. For solar eclipses you have to use special eye protection and special camera filters. If you havenʼt ventured to to a total solar eclipse, go if you can – it is one of natureʼs most wonderful marvels! 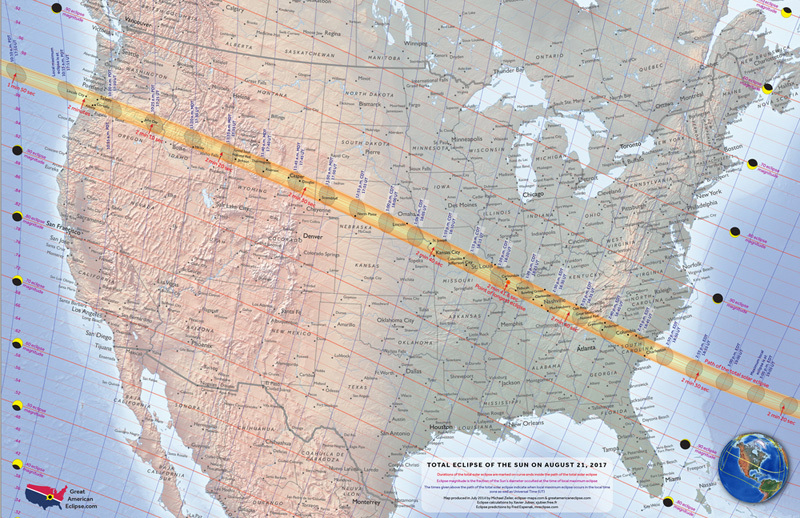 There will be a total solar eclipse crossing the United States on August 21, 2017 - go to a place in the path of totality if you can! There is a website for this eclipse at http://www.greatamericaneclipse.com/.